Wind turbines have ability to store electricity those are excess for future demands. In following figure we will come to know that how electricity is generated via velocity of wind or how kinetic energy of wind is converted in to electrical energy. There are following steps that we have to consider during the designing of given wind turbine. First of all we have to observe about the wind resources, it could be done with the help of anemometer that monitors the wind. We may also refer the wind speed indicator or some technical tools that provides the knowledge about wind flowing for a given time. During the designing of wind turbine we have to select the location of turbine as it will play a vital role in its performance, we should always care to locate the turbine after considering following points. Environmental point of view for example birds may affect the performance of our unit. Obstacles (like trees)availability are more or less. In this step we have to consider all those points where we have to pay and these are as following. Costing of selection and studying of sites. Components costs such as inverter ,turbine, tower , foundation of tower , transmission system grid & wind turbine controller. Preparing the layout, foundation and other civil work design. 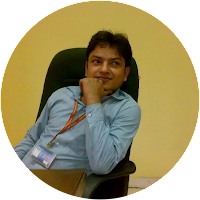 Selection of turbine , inverter ,tower & controller on the basis of capacity of unit and site condition. Costing by demanding and comparing quotations of erection, commissioning & maintenance of unit and on the basis of lower cost quotation and best quality work we have to place the order. In this step we have to secure the permission to go ahead after convenience our requirements, investment & benefits. In this step we have to start our civil foundation & erection work, normally we consult and appoint an installer to supervise & support the team members during erection work. We also always prefer to minimize the cost & time of erection after consulting with appointed installer. We have to secure the permission from electric cooperation to connect our system with the grid. Once installation and grid connection completed, we may run our unit and it must be noted clearly that our wind turbine should be inspected on routine basis and undergoes with preventive & predictive maintenance. In order to predict the power production of our turbine, first we have to understand the average speed of wind at the position of wind turbine, in order to know how average speed of wind will affect the performance and production capacity of turbine, we may refer following graph between changes in the yield of wind turbine, frequency with respect to speed of wind. The main factor that affects the power performance will be the rotor size. Another point that affects will be the control principles for example stall control, pitch control & active stall control etc. Power production by wind turbine may be calculated by following formula. CP Efficiency factor is basically product of the mechanical efficiency, electrical efficiency & aerodynamics and it must be noted that these mentioned factors are dependent on speed of wind and generated power simultaneously. Mechanical efficiency is estimated by losses in gearboxes and it must be in range of 0.95 to 0.97 as this range is acceptable at full load. Electrical efficiency is estimated by losses in electrical circuit & generator and it must be in range of 0.97 to 0.98 as this range is acceptable at full load. 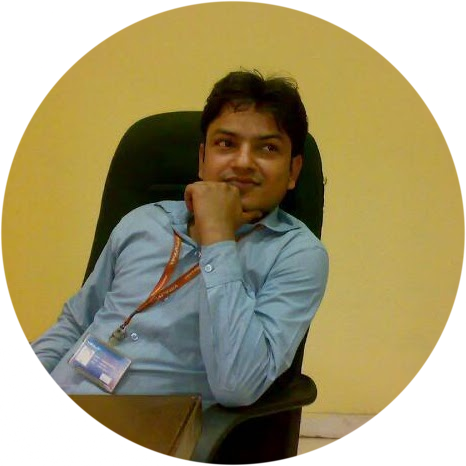 It is observed that the maximum value of efficiency factor will be at wind speed of 7-9 m/s and it will be maximum 50%. 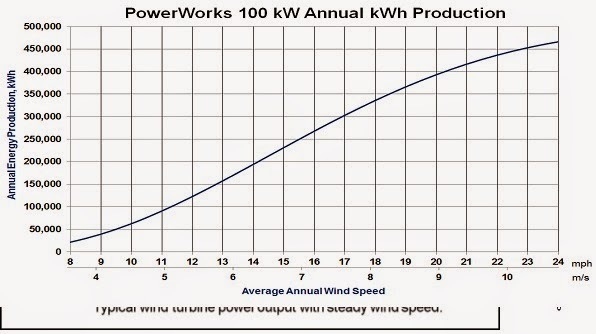 In following power curve we may easily see that power generation will vary along with the speed of wind power. 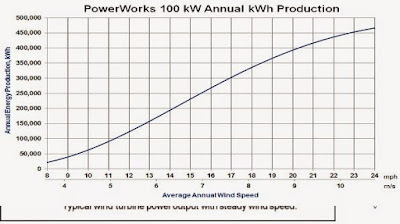 In following curve we may secure the basic information about the energy production in KWh on annual basis for given annual average wind speed. Wind power unit are based on its foundation, so we need to know that how foundation of wind turbine units are made. 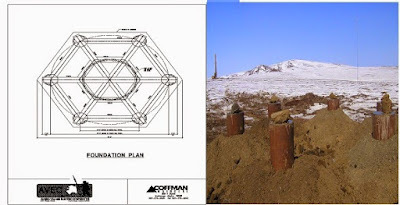 In following figure we have represented the elevation for tower foundation and its plan. Points that we have to follow are specified below. 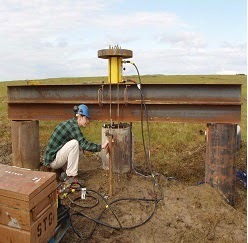 Now pile will be undergoes through inspection of load carrying capacity, with the help of hydraulic jack as shown in below figure about a load 580 KN with allowable movement of 0.48 mm.